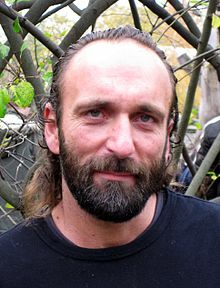 Thomas Dörflein (13 October 1963 – 22 September 2008) was a German zookeeper at the Berlin Zoo for 26 years. He became a celebrity after he took care of the polar bear cub Knut, who had been abandoned by his mother shortly after his birth in 2006. In 2007, Dörflein was awarded the Medal of Merit by the city of Berlin for helping to raise Knut. ↑ "Zookeeper who hand-reared Knut the polar bear is found dead | World news | guardian.co.uk". The Guardian. London: GMG. ISSN 0261-3077. OCLC 60623878. Retrieved 19 March 2011. This page was last changed on 12 March 2013, at 01:57.